A couple of years ago I read a book by Jim Collins titled Good To Great. In his excellent book, Mr. Collins showed the findings of his research team that contrasted companies that went from good to great and stayed there over a fifteen year period with good companies that failed to make the leap from good to great. One of the aspects of the good-to-great companies was that they exhibited the Hedgehog Concept. As I read this section it became very clear to me that great pitchers apply a Hedgehog Concept to what they do and to their strategy. What is the Hedgehog Concept? The idea is taken from an essay, “The Hedgehog and the Fox,” by Isaiah Berlin , which he based on an ancient Greek parable. In short, the parable goes like this. The hedgehog is a porcupine like creature that waddles along scrounging for food and taking care of his home. The fox is a sleek, cunning, fast, beautiful creature that is always strategizing how he can catch the hedgehog. He circles and hides day after day near the hedgehogs den waiting for the perfect chance to catch his prey. At the perfect time the fox attacks. The hedgehog only knows one thing and that is to roll up in a ball and stick out his quill like spikes in all directions. At that point the fox calls off his attack and retreats to think up a new strategy. The hedgehog always wins despite all the cunning strategy of the faster, sleeker fox. I have used Jim Collins’ model to construct a Hedgehog type Concept for pitchers. (2) This Hedgehog Concept is a simple basic principle made up from understanding the interaction of the three circles I have intertwined below. Understanding what you believe you are the best in the world at. Understanding what drives your success engine or what is essential to your success. Understanding what you are deeply passionate about. Roger Clemens is the ‘Rocket’. Nolan Ryan was ‘The Express’. Tommy John was ‘Super Sinker’. Sal Maglie was ‘The Barber’. All of these pitchers and every other pitcher is known to hitters by how they are going to try to get them out. Clemens and Ryan wanted the hitter to know that they were going to have to prove they could hit the fastball up and in. Tommy John wanted hitters to know they were going to have to hit his sinker. I ask young pitchers if they have ever seen Tom Glavine pitch. When they respond positively I ask them, if you were hitting off of Tom Glavine, where would you look for the ball? They tell me, correctly, low and away. I say exactly, and if you know that, don’t you think the hitters know that? The point is that, not only do the hitters know where Tom Glavine or any other great pitcher is going to throw the ball, those pitchers want you to know it because it mentally puts the hitter in a position where he must adjust to the pitcher’s best pitch. When I say a pitcher’s best pitch I’m not talking about just a fastball up and in or a sinker low and away or any other pitch, I am talking about that pitch and the mastery of its zone. If a pitcher is going to dominate hitters, he must be willing to work hard enough to be able to consistently throw his best pitch to the zone where it is hardest to hit. If it is an up and in fastball, he must be able to go up the ladder with it, to miss inside with it and to throw a strike with it when he wants to. If it is a sinker low and away, he must be able to miss low or away when he wants to, throw it for a low and away strike when he wants to, and for added advantage, take something off of it when he wants to. It is the same thing if a pitcher’s dominant pitch is a curve ball or a change-up. He must master the pitch and its zone to the point of believing that he is the best in the world at what he does. This ability is what sets him apart and makes him unique to all other pitchers. No two pitchers are exactly alike, and all great pitchers or at least ones with a long enduring career, have something they do that all hitters know they have to contend with every at bat. Most young pitchers think they have to out ‘stuff’ the hitters or trick the hitters. They also think they have to throw the fastball to all four corners of the strike zone. Catchers don’t have enough fingers to signal for the number of pitches many pitchers think they need to get hitters out. That is definitely the ‘fox’ approach. The idea that you, as a pitcher, have to trick the hitter is quite offensive to me. It puts the pitcher on the defensive and takes him out of control of the hitter. The best way, and the simplest, is to take the ‘hedgehog’ approach and work at mastering a pitch and its zone to the point where you believe and understand that it is the best in the world. It is so important to understand what you can be great at as well as not wasting your time on trying to develop pitches that will always be difficult for you to throw consistently. Your pitch has to be so good that you want the hitters to know it is coming and to look for it. That one pitch is an essential foundation, setting up the rest of your strategy. Once you have a pitch that you believe is the best in the world, you must strategize and develop the few or simple aspects of your game that are essential for your success. The first thing to consider is what pitches to throw when a hitter shows that he is finally starting to adjust to your dominant pitch. By the time a hitter shows that he is getting to Clemens’ high fastball, he either gets one higher and tighter or he gets ‘Mr. Splittie’. Roger’s split finger is not always thrown for a strike but, because it comes out of the same slot as his high fastball, hitters end up swinging at it with no chance of hitting it hard. Roger also throws an occasional slider for a strike or strike out when he needs it, but generally his game is pretty simple. If a hitter starts to adjust to Glavine’s outside fastball, he gets about four different speeds outside or he gets a little cutter in off the plate that hitters jam themselves with. Once again, nothing complex is going on except in the mastery of his dominant pitch and zone. The most simple strategy is that of Mariano Rivera. He has mastered throwing cut fastballs up and in to lefties and away to righties. Once in awhile he throws the cutter to the other side of the plate and once in a great while he throws a regular fastball away to lefties and in to righties. He truly understands and believes how essential his cutter is and pretty much ignores trying to throw other pitches. These pitches I have described are complimentary or antagonistic which I will cover in a future segment of pitching strategy. One of the best statistics to consider when mapping out a successful winning strategy is ‘total bases per inning pitched’. That is total bases (walks, singles, doubles =2, triples =3, HR=4) plus HBP, WP, and SB, minus caught stealing and pick-offs per inning pitched. A pitcher that averages nine strike outs a game but gives up 5 hits with two doubles and walks seven with two stolen bases and a wild pitch has an All Bases Per Inning Pitched average of 1.89. A pitcher that strikes out three and gives up nine hits per inning pitched with one double and one walk and no wild pitches or stolen bases has an All Bases Per Inning Pitched average of 1.22. The strikeout pitcher may show better but the second pitcher is more effective. So it is best to look at the things a pitcher can do to lower the total bases he gives up per inning pitched. Just walking fewer batters and developing pitches that have less of a chance of going for extra base hits can increase one’s effectiveness significantly. In conclusion, there should be just a few essential things that a pitcher works to master that he understands will bring him the most success. I knew Tommy John for a long time and he was always experimenting with something new. However, when it came down to it, he was just adding a little something to his sinker or his breaking ball. When I broke into the big leagues in 1973, my main pitch was a hard breaking ball. I had two different fastballs, a change-up and a split finger (then called a fork ball). Near the end of my career in the early eighties, I was more consistent and had more success even though I had lost my hard curve. My change-up became the pitch that I believed was the best in the world, and I complimented it with a cutter to the other side of the plate. Was my change-up the best in the world? Few probably believed it was, but because I mastered it and believed in it, I pitched whole innings with nothing but change-ups. I am convinced that if you observe the great pitchers of today you will see that they are ‘hedgehogs’. They believe they are the best in the world with at least one of their pitches, and they understand what is essential to their success and ignore the rest. For pitching coaches, I am convinced that, after helping develop the will to win, we must help young pitchers develop a ‘hedgehog’ mentality. 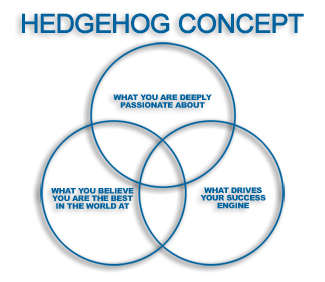 As important as the first two intersecting circles are of the Hedgehog Concept, the most crucial aspect for enduring success may be to understand the ramifications of your passion. Our lives are made up of choices that we make day in and day out. We make good choices and we all make bad choices. When we make bad choices we carry the consequences and the ramifications of those choices with us, sometimes for the rest of our lives. With all the baggage accumulated over the years, winners still press on, forget what lies behind, live for a higher cause, and make increasingly better choices. What you are deeply passionate about drives you to make choices that are essential to your short term and long term goals. They are what cause you to make good choices when no one is looking. My fear today is that young men are growing up and not learning about this great game of baseball. Many of my current students don’t even watch the game. They know little of the history of the game and what an important part it is of Americana . I so firmly believe that baseball, because it is so dominated by having to overcome failure, (three hits out of ten at bats is success) teaches us more about life than any other sport. It is such a microcosm of life. It is a team game, and yet, you and only you can get a hit or make the play or throw the right pitch when the ball is coming to you or in your hands. Each game is a virtual chess match overflowing with strategy from pitch selection to offensive attempts to defensive alignments. Orel Hershiser has said that major league baseball is the only sport in the world where the pitcher develops a relationship with his opponent, the hitter. Because you face him so many times, each of you has an understanding of what the other is trying to do, and you are constantly adjusting to each other and trying to figure out what each other is thinking. I don’t need to say it. If you are around me for any time at all, you know how much I understand my passion for this game. It was that passion, a note from my dad, my faith, and my wife that kept me driving forward when so much of me wanted to quit. A couple of years ago, I interviewed pitchers past and present, Bob Cluck, Orel Hershiser, Jamie Moyer, Curt Schilling, Kevin Brown, Randy Wolf, Mike Maroth, and Jeremy Bonderman. Every one of them didn’t have to say a word. The way they answered my questions showed a deep passion and respect for the game. Even the young pitchers had a deep respect for how difficult the game is and how privileged they were to be playing it, especially in the big leagues. When it comes down to it, there are so few that get to play on the college level let the big leagues. Sometimes passion surfaces in other forms but it is almost always driven by love. Love is the greatest motivating force in the universe. I mentioned a note from my dad. My dad had Parkinson’s disease from the time I was 13 years old. By the time I was 16, he had to give up playing catch with me. That year he wrote me one of the only notes he ever gave to me. In it he said that all he had to show for playing catch with me was a bent ring. He went on to say that he thought I had what it took to play in the big leagues. He passed away from a stroke at the end of my freshman year at college. The words of his note never left my awareness. Because my dad loved me so and believed in me, I had a deep passion to be as good as I possibly could be and to fulis belief in me. Many players are driven by their faith. The Christian faith is based on the Bible’s teaching that God loved the world so much that He willingly sacrificed His own Son to pay the penalty for our sins, so that all who believe on Him can have eternal life. Christian players believe that God gave them the talent to play and that, by playing with a passion of gratitude for such unmerited it pleases God. Whether it is an understanding of passion for the game or of a passion to return and reward love that is given to you, it is the driving force that causes you to press on when circumstances seem so bleak. It is what causes you to know that the game and life are bigger than you are and that you are so privileged to be given the talent to play it. Passion also causes you to understand that what you do has value outside of just playing the game for yourself. Hopefully, it also leads to giving a part of you back toame and to life. The Hedgehog Concept, so simple in its three intersecting aspects, and yet, a directive to see what is absolutely essential aignore the rest.